Adi Da Samraj was born on Long Island, New York, on November 3, 1939. His birth name was “Franklin Albert Jones”. From His birth, He was established in a unique state of spiritual illumination He has called the “Bright”. He describes it as a “boundless feeling of Joy, Light, and Freedom” that He knew to be the Divine Condition absolutely. However, He also noticed that others were not aware of the “Bright”. 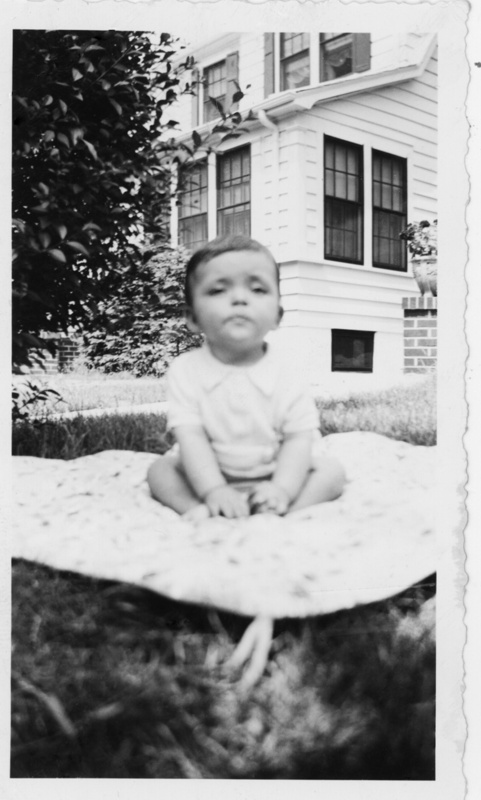 At the early age of two, Adi Da Samraj spontaneously made a conscious choice to “become” a human ego, to become the human child that His parents had named “Franklin Jones”. In His early life, Adi Da submitted Himself to an ordeal of “self-identification” with all the limitations and sufferings of human existence in order to experience, firsthand, what the human “problem” is, or why people suffer so much unhappiness. He made it His life’s purpose to discover how that “problem” can be overcome, how it would be possible for everyone to realize the supremely blissful state of Divine “Brightness” that He had known since birth. He describes His early years as being focused in two fundamental activities: investigating how to perfectly realize the truth of “Reality Itself”, and developing the ability to communicate the truth of “Reality Itself” through both visual and verbal means. Adi Da’s pursuit of this investigation carried Him through intensive studies and experimentation with all forms of experience, high and low. He graduated from Columbia University in 1961, with a BA in philosophy, and from Stanford University in 1966, with an MA in English literature. His master’s thesis, a study of core issues in modernism, focused on the literary experiments of Gertrude Stein and on the modernist painters of the same period. In 1964, He began a period of intensive practice under a succession of spiritual masters in the United States and India, a practice that led Him to experience the highest forms of traditional mystical attainment. In 1968, he went to India and approached the renowned spiritual master Swami Muktananda of Ganeshpuri, who immediately responded by saying that Adi Da was a spiritual master by birth, and “the most extraordinary Westerner” he had ever encountered. One year later, in a unique letter of acknowledgment, Swami Muktananda made an open public declaration that Adi Da was, by virtue of His evident spiritual signs and demonstrated states, inherently qualified to teach others independently, and to awaken others spiritually by direct transmission. Having explored Western philosophy in the academic setting of great universities, and having completed a tour of the spiritual quest in relationship with His Eastern teachers, Adi Da Samraj knew that none of the traditional “answers” were “it”—because none of them were equivalent to the egoless state of perfect Divine “Brightness” He had known at birth. Finally, in 1970, after undergoing a final period of intense spiritual endeavor, Adi Da Samraj spontaneously became re-established in the “Bright”. While meditating in the Vedanta Society Temple in Hollywood, California, He suddenly and perfectly “regained” what He had (at two years of age) volunteered to “lose”, and this re-awakening signaled the end of His thirty years of spiritual quest. Now He was equipped with the fullest possible experiential knowledge of the human condition and the process of spiritual growth, so He could begin His work of teaching others. From the very beginning of His work, Adi Da made it clear that what He offered to His devotees was “a relationship, not a technique.” He entered into His teaching as a new form of submission work, teaching those who came to Him by addressing their doubts, questions, and dilemmas. In this process He considered every aspect of human life, including functional, practical, relational, and spiritual life. For many years He taught in a heroic manner, using unconventional means to reflect His devotees to themselves, and thus serve their spiritual awakening. During the years of His teaching work from 1972 to 2000, Adi Da Samraj was working to create an entirely new way of life―the way of devotional and transcendental spiritual relationship to Him, to which He gave the name “the Reality-Way of Adidam”. He established and spiritually empowered five hermitages and sanctuaries in Northern California, Hawaii, and the Fiji Islands: the Mountain of Attention Sanctuary, Tat Sundaram, Ruchira Dham Hermitage, Da Love-Ananda Mahal, and Adi Da Samrajashram. Adi Da’s teaching evolved in phases and periods, marked by profound transformations in His work with devotees, and in His own body. Frequently He took on new names, coinciding with new phases in His life and work. Just as the end of His early-life period was signaled by the completion of His quest for understanding and illumination, culminating in the event of His re-awakening, His period of teaching also came to an end, in a series of culminating events that transformed the nature of His work. In 1986, and again in 2000, He experienced extraordinary death-like yogic events, swoons of loss of bodily consciousness unexplainable by modern medicine. In these events His body became more profoundly transformed and transfigured by the Divine “Bright” Condition which He had realized and revealed, and His disposition moved more and more from that of teaching to that of universal blessing. After 2000, Adi Da Samraj’s work became that of direct revelation, the pure communication of the “Bright” state that was His illumined experience at birth and always. From that time, until the end of His physical life in 2008, Adi Da lived primarily at Adi Da Samrajashram, His island-sanctuary in Fiji—a place spiritually empowered by Him as the primary seat from which His blessing flows perpetually to the world. He continually magnified His universal blessing regard from there, inviting His devotees into His company on spiritual retreat, and constantly working to express the truth of existence through modes of communication to which all human beings can respond—including literary, theatrical, artistic, and philosophical works. On November 27, 2008, Adi Da Samraj passed from His physical body while working in His art studio in Fiji. His passing was sudden and peaceful. On the morning of His passing, He completed His writing of The Aletheon, the book He designated as “first and foremost” among all His writings. For years He had spoken of His inevitable bodily passing, and how He worked to leave humankind with forms of agency through which His blessing presence would forever be felt and magnified, and an eternally living relationship with Him would always be possible. Through His empowered hermitages and sanctuaries, His vast literature of spiritual revelation and instruction, His monumental image-art, and the storied lessons of His uniquely born life, Adi Da Samraj has made Himself transcendentally spiritually available to everyone, now and forever.